Hokkaido is the largest prefecture of Japan, with a total land area of nearly 80,000 km². When traveling in Hokkaido, it is important to keep in mind travel times and distances, as many famous spots can be quite far away from each other. While some large cities can be quite convenient in terms of transport, many places in the countryside can be difficult to access by public transportation. This article gives a summary of the different transportation options available when traveling within Hokkaido. Trains operated by JR Hokkaido cover most major cities in Hokkaido. Trains can take you to your destination fairly quickly, and they let you enjoy Hokkaido’s beautiful landscapes from the windows. However, services may be infrequent in some areas, and they may stop or be delayed due to accidents or harsh weather conditions. You can check the schedule, routes, and operation status of JR train lines from the JR Hokkaido website. If you plan on using the train a lot in Hokkaido, you should consider buying a Hokkaido Rail Pass (available only to foreign tourists). This pass lets you travel on all JR Hokkaido trains (except the Hokkaido Shinkansen) and some designated JR buses within Hokkaido. You can choose from a 3-Day, 5-Day, or 7-Day pass, or a Flexible 4-Day pass (valid for 4 days of your choice within a 10-day period). You can buy the pass at major train stations in Hokkaido, or purchase a voucher in your home country and exchange it for the pass after arriving in Hokkaido. Sapporo City has a municipal subway system that consists of three lines: the Namboku Line, the Tozai Line, and the Toho Line. Using the subway can be a cheap and convenient way to travel to the different sightseeing spots in Sapporo City. One day tickets that allow unlimited rides for a whole day are also available. For more information, visit the Sapporo City website. Sapporo City and Hakodate City both have a streetcar/tram system (known in Japanese as shiden). It can be a cheap and convenient way to travel within each city. The streetcars themselves are tourist attractions, as they come in various models and designs, from the antique to the modern. For more information, visit the respective websites of Sapporo City or Hakodate City. 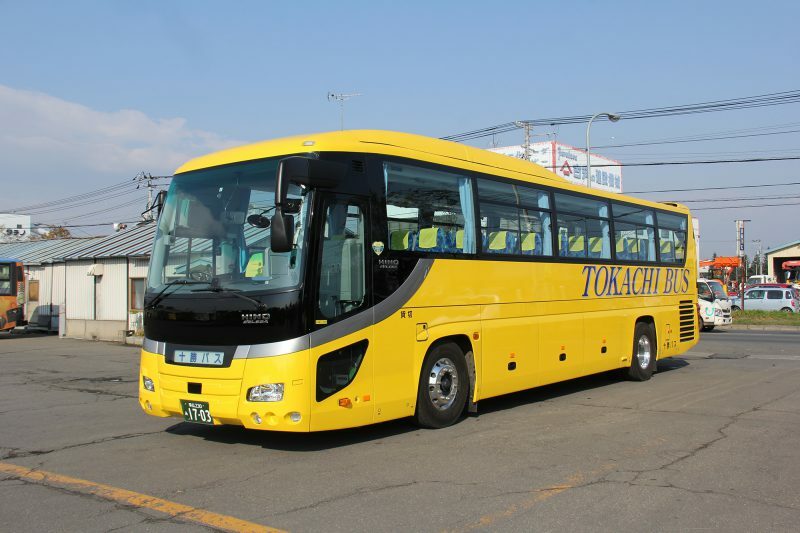 Hokkaido has a large network of buses that includes route buses that run within cities or local regions, long-distance express buses that connect major cities, and sightseeing buses that visit designated tourist spots on specific periods. 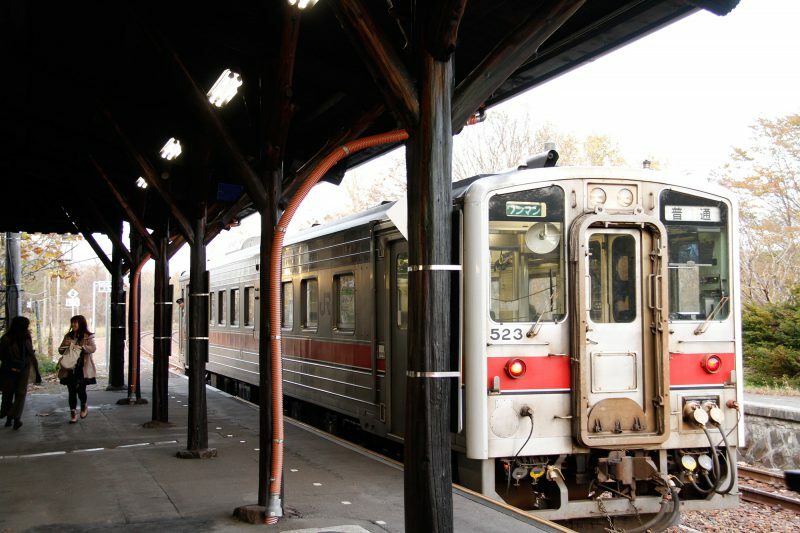 Compared to trains, long-distance buses are usually cheaper but have longer travel times, so they can be good options if you are not pressed for time. For local route buses, each city or region can have more than one bus company, so you need to check with each company for detailed fares, routes, and timetables. 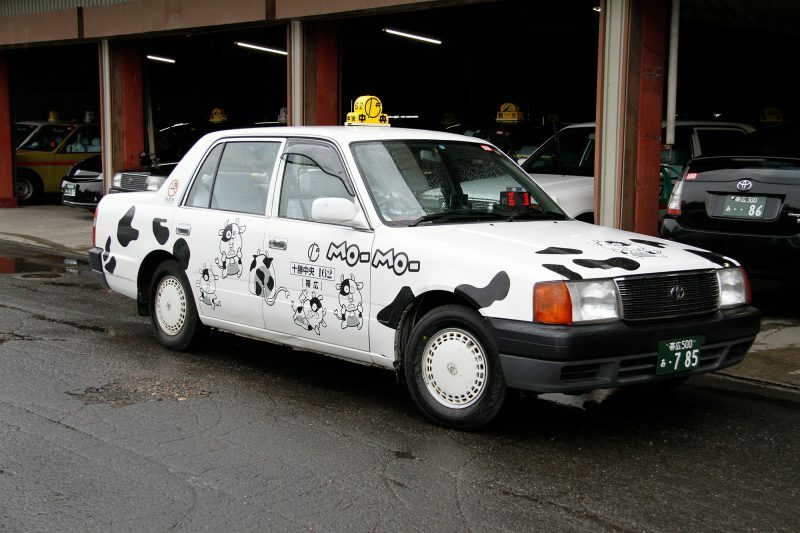 Taxis are available in most cities and towns in Hokkaido. You can board them at designated taxi stands or hail an empty one on the road. The basic fare is 670 yen for the first 1.6 kilometers plus 80 yen for every 300 meters (varies by area and car type). They can be a bit expensive depending on your travel distance, but they can also be convenient if there is no public transportation going to your destination. Many taxi cabs accept payment by credit card. Some friendly taxi drivers may also share with you some local sightseeing information or shop recommendations. Self-driving is probably the best option if you want to visit various attractions in different cities, especially lesser known areas. Car rental shops are available at most airports and major train stations, and you can choose to rent various kinds of vehicles, from compact cars to SUVs. You can even make a reservation on the Internet in advance. Almost all rental cars are equipped with a convenient navigation system that can guide you to the destination you input. 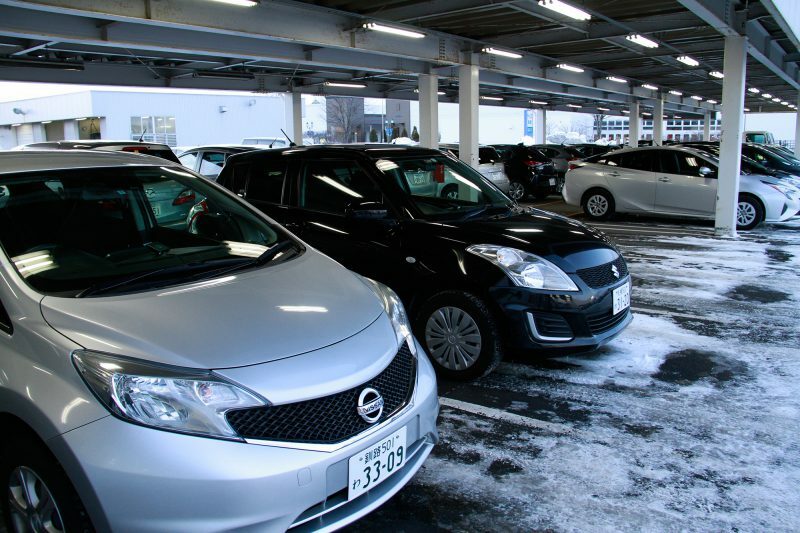 To rent a car in Japan, you need to present a Japanese driver’s license, or an international driving permit together with your passport (requirements may vary depending on your nationality). Hokkaido has plenty of straight, wide roads, especially in the countryside where there are fewer cars, and there is a tendency to drive too fast on them. Always control your speed and observe traffic rules. Watch our for wild animals such as deer or foxes crossing the road, especially during the twilight hours or at night along mountain roads. Always pay attention to the road in front of you, and drive within the speed limit. When driving long distances, you should take a 10 to 20 minute break every 2 hours. If you feel tired or sleepy, do not force yourself. Stop at a parking space or rest area and take a rest before continuing to drive. Keep an eye on your fuel gauge. Gas stations can be few and far between in the countryside, and they may close quite early. For more information, check out the Must-have Handbook for Driving in Hokkaido. You should also read and understand the materials provided by your car rental company. 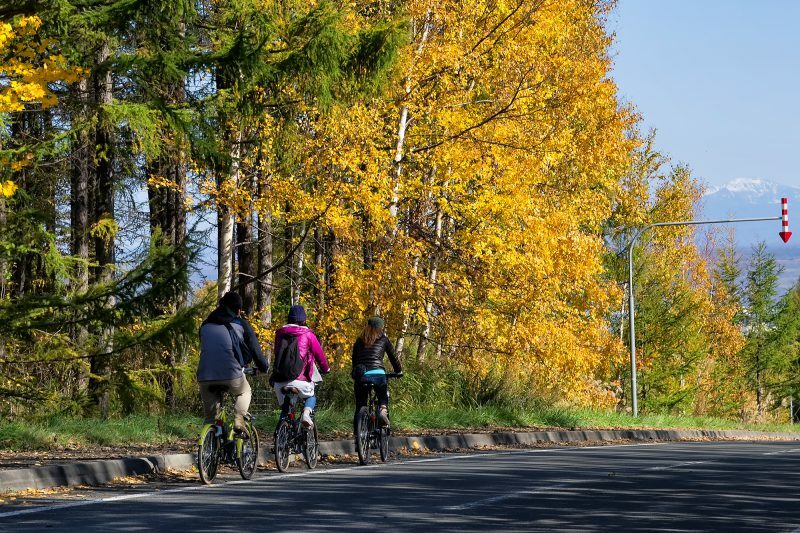 Hokkaido is a paradise for cycling, with its wide, well-maintained roads and scenic roadside landscapes that change across the seasons. You can follow one of the many recommended cycling routes, or just simply ride a bicycle to travel short distances within a town or city. Bicycle rental services are available at some train stations and tourist information centers. Some tour operators also offer cycling tours. For more information, visit the Hokkaido Cycling Tourism Guide website. Riding a ferry is the most practical option if you want to visit Hokkaido’s small islands. The ferry ride usually takes a few hours, and you can enjoy the views of the vast ocean or just take a rest inside the cabin. You can even take your car, motorcycle, or bicycle with you on board so you can easily explore the island of your destination. There are currently 12 airports in service in Hokkaido, some of which offer flights within the prefecture. They can be a good option if you need to travel very quickly from one city to another or if you want to visit Hokkaido’s small islands. 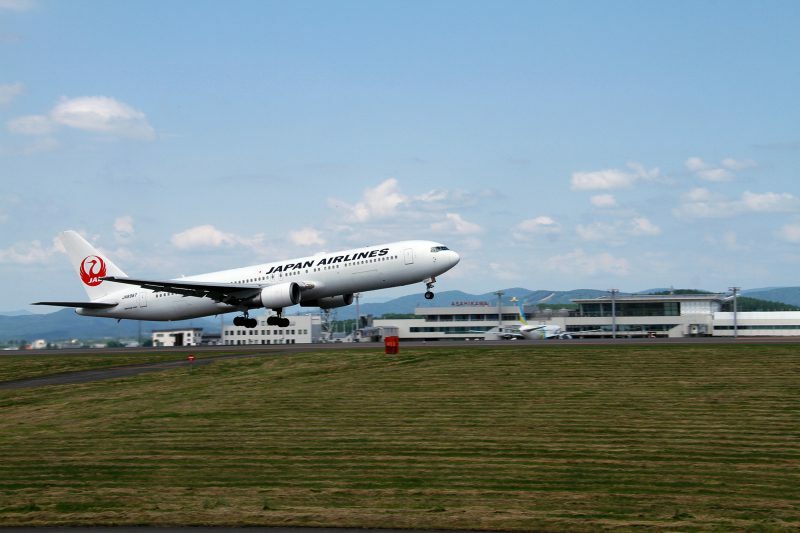 The largest airport in Hokkaido, located around 45 kilometers south of Sapporo City. It serves many international and domestic flights, as well as flights to Hakodate, Wakkanai, Memanbetsu, Nemuro Nakashibetsu, Tancho Kushiro, and Rishiri airports. A small airport located in the northeastern part of Sapporo City, it serves flights to Hakodate, Rishiri, Tancho Kushiro, and Misawa airport in Aomori Prefecture. Located in the eastern part of Hakodate City, it serves flights to New Chitose, Sapporo Okadama, and Okushiri airports. This small airport in Okushiri Island serves one flight to and from Hakodate Airport per day. Located around 15 kilometers from central Asahikawa City, this airport is a good access point for visiting Asahikawa, Biei, and Furano. 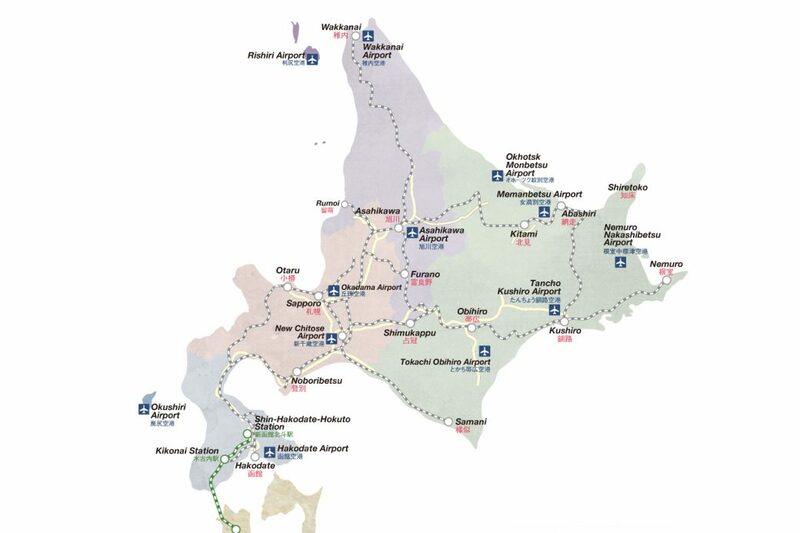 Japan’s northernmost airport in Wakkanai City serves flights to New Chitose Airport and Haneda Airport in Tokyo. This small airport in the northern edge of Rishiri Island serves limited flights to New Chitose and Sapporo Okadama airports. Located around 25 kilometers south of central Obihiro City, it is a good access point for traveling in the Tokachi region. Located around 20 kilometers west of central Kushiro City, it serves flights to New Chitose and Sapporo Okadama airports. Located in Ozora Town, it serves flights to and from New Chitose Airport and is a good access point for traveling in Abashiri, Kitami, and Shiretoko. This easternmost airport of Japan is located in Nakashibetsu Town and serves flights to New Chitose Airport. This airport in the northeastern coast of Hokkaido serves only one flight to and from Haneda Airport in Tokyo per day. Note: Information is correct as of January 2019.